During our packing project, a dried, ‘dessicated’, cat was re-discovered in the collection and nicknamed Mystery Mog. Unexpectedly, this unusual creature was requested for loan and is currently on tour in Lancashire, being privileged by its inclusion in the 400th anniversary exhibition of the infamous Lancashire Witch Trials. Objects such as dried cats, horse skulls, old shoes, written curses and charms, witch-bottles and ritual marks were often placed in buildings. These objects, and many other kinds of object, were usually concealed in buildings and sometimes outdoors for use as spells or counter-spells, currently not a lot is known in detail about them, but often relate to common superstitions of the time. In the 17th Century cats were regarded as being particularly gifted with a sixth sense and connection with the afterlife. So, perhaps it was hoped that the family cat, who served so well in life, could exercise its hunting prowess against vermin and its psychic abilities in the afterlife, to continue to protect the home and family in death. Cats were regarded as being capable of warding off evil spirits, witches spells and curses. They were believed to protect the home and were hidden in walls, floors or attics for this purpose. This was done intentionally, sometimes with the cat’s innards being removed, like ours, and being dried and stuffed with straw. Often they were placed in a hunting position – indicating their protection from rats and mice in the home. Close up of the head of our dessicated cat, packed for transportation. From the early 1600s whole districts in some parts of Lancashire were perceived as riddled with the presence of witches; men and beasts were though to be haunted by their charm, and this superstition which preyed alike on the learned and the poor did not allow any family to suppose that they were beyond the reach of the witch's power. Our cat is currently on display at the very grand Gawthorpe Hall, which is the first venue for the “bewitching and fascinating” exhibition 'A Wonderfull Discoverie; Lancashire Witches 1612 - 2012' until 8 July, when the exhibition will tour to Lancaster City Museum from 21st July until 29th September 2012. The exhibition marks the 400th anniversary of the witch trials held at Lancaster Castle in 1612, among the most famous in English history. The twelve accused people lived in the area around Pendle Hill in Lancashire and were charged with the murders of ten people by the use of witchcraft. Watch the video above for a short introduction about the Pendle Hill Witches and the 400th anniversary. The trials examined the following events: Elizabeth Southerns, also known as Old Demdyke, had persuaded her daughter, Elizabeth Device, to sell herself to the devil. She in turn initiated her daughter, Alison Device, into these dark arts. Accused of killing men, children and animals that they bore a grudge against by using clay figures and pricking holes in them with pins, as well as casting spells against them, they were found guilty of these crimes. 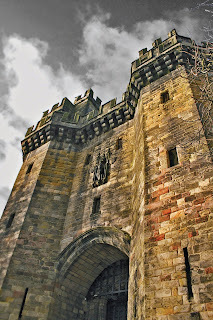 The Justices of the Peace, Roger Nowell and Nicholas Bannister, learned that a barn called Malkin Tower in Pendle Forest, the home of Old Demdike and her daughter, was the meeting place of the witches, and arrested Old Demdyke, Elizabeth and Alison Device, imprisoning them at Lancaster Castle. Once they had been sent to Lancaster prison, a grand meeting of seventeen witches and three wizards is said to have been held at Malkin Tower on Good Friday, 6th April 1612, where they decided to kill Mr. M'Covell, the governor of the castle, and blow up the building, to enable the witches to make their escape. Reported upon at the time once the meeting ended the witches “walked out of the barn, but on reaching the door, each mounted his or her spirit, which was in the form of a young horse, and quickly vanished”. In total twenty witches and wizards were arrested and tried, ten being found guilty and executed in August 1612. Elizabeth Southerns, Old Demdike, escaped her fate, worn out by age and trouble, she died in prison. But her daughter and the others were brought to trial. There are accounts of the confessions made by them at trial written up after the event by Thomas Potts one of the Clerks of the court, although his work is understood to be leading in its language and is not a word by word account of the proceedings. See here for his account of the Confessions of the Witches. 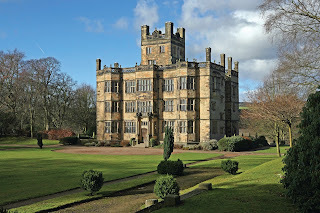 'A Wonderfull Discoverie' Exhibition gallery at Gawthorpe Hall. If you are visiting or live near Lancashire why not find out more about this curious part of history and the Pendle Hill Witches – our cat will be there warding off any bad spirits, so you needn’t worry no harm will come to you! 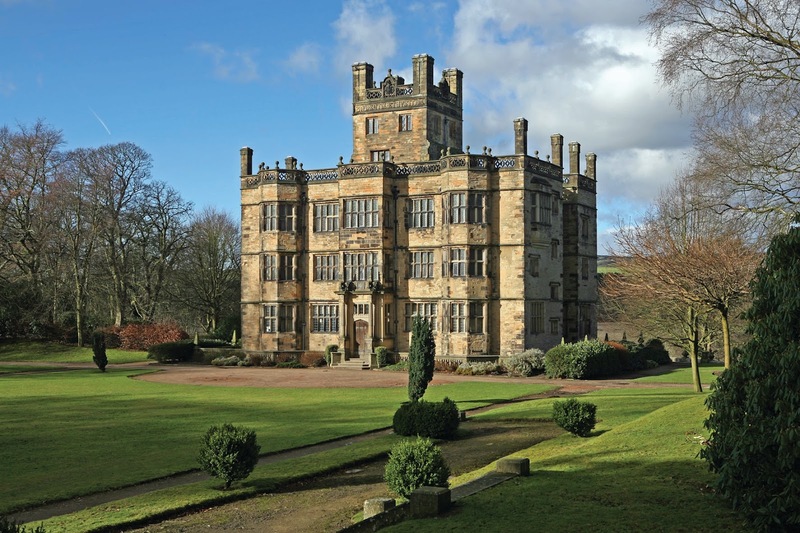 "A Wonderfull Discoverie" will be on display at Gawthorpe Hall until 8th July, and Lancaster City Museum 21st July – 29th September 2012. Thanks to Lancashire County Museum Service for requesting the loan, including facilitators Sue Ashworth, Caroline Wilkinson and Heather Davis.